Monica Geller’s apartment in “Friends” is one of the most iconic TV homes in television history, and the style and decor was quintessential '90s (the sitcom first aired in 1994). If Monica and the crew were around in the Roaring '20s, the apartment might have had art deco furniture, along with clean, bold lines and glossy surfaces. The reimagined home would have chic green walls, checkered floors and “Great Gatsby”-inspired accents. Clean lines and natural-looking furniture (aka “Scandi-chic”) was big in the 1930s, and Monica might have splurged on an Alvar Aalto chair, pictured on the far right. How you doin’, floral sofa? In the 1940s, patterns were all the rage. In this design, Monica’s dining table sits on an abstract rug, and the set includes tub dining chairs, which seem cozy for all those uncomfortable Thanksgiving dinners. Sleek midcentury modern furniture and bright colors give the room a fun pop in this design inspired by the 1950s. Things get even brighter in the '60s. For this design, the team came up with "far-out" patterns and crazy colors, along with a cool, Space Age light fixture Ross would have certainly loved. Even bolder hues take over the apartment in the 1970s. A pink pinstripe wallpaper clashes but still looks cool against the cherry red sofa and green armchair. The Guzzini-style mushroom lamp hangs over the living area. Pink walls and white accents create the backsplash of Monica’s '80s apartment, complete with tufted and wood furniture, and a sparkly chandelier. 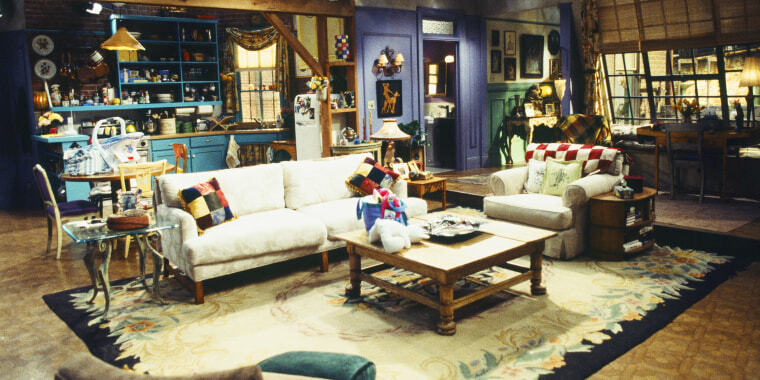 Wonder what Monica's abode would look like present today? See the reimagined apartment here!